After the turn of the century, Vaudeville artists began to summer in the Blufton area of Muskegon, MI. As Blufton was located on a stretch of land between Lake Muskegon and Lake Michigan, their boats began to accumulate there as well, which in 1916 resulted in the formal incorporation of the Theatrical Colony Yacht Club (TCYC). 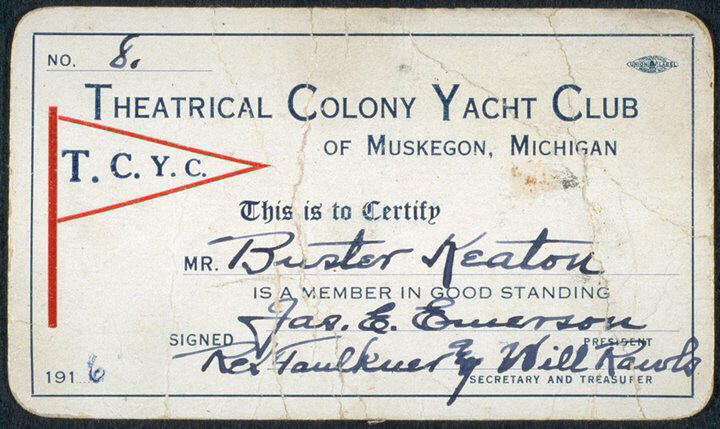 The membership card that certifies that "MR. Buster Keaton" is a member of good standing, as seen at the Actors' Colony website, http://actorscolony.com, shows a white burgee with a narrow red border, and with T.C.Y.C. in blue serif letters, shrinking in font size towards the fly. By 1938, most of the actors had either left because they had found work elsewhere or had left to find work elsewhere. That year the club house was sold, and it seems likely that the club itself ceased to be at that point.